CraftSanity on TV: Making Envelopes and Tiny books Using Handmade Paper From Maple Street Paper Co.
Hi! CraftSanity Magazine issue 4 is coming soon. In the meantime, here are a couple quick paper projects for you to try. These projects were inspired by Whitney Korstange, a Fremont artist who operates a paper mill called Maple Street Paper Co. 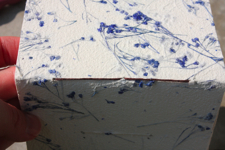 Her handmade paper is beautiful and available for purchase online and in person at the Fulton Street Artisans Market from 11 a.m. to 3 p.m. on Sundays throughout September. Find out more about Whitney by reading my column in this Sunday’s Home & Garden section of The Grand Rapids Press. 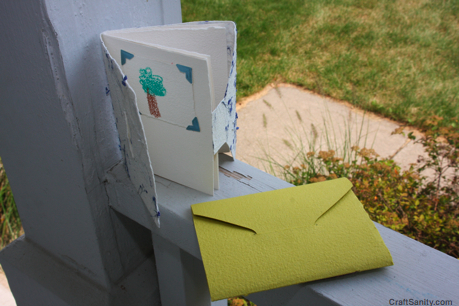 I demonstrated how to make a mini envelope journal on WZZM’s “Take Five & Co.” this morning. You can download the mini envelope PDF template to make your own, or order a larger finished one from Hilary’s shop. 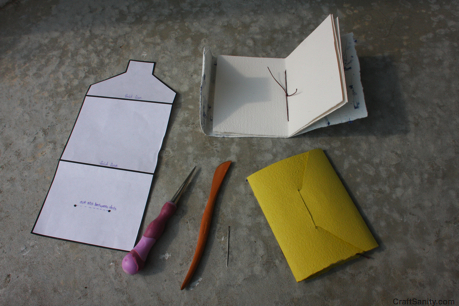 To make a mini envelope journal, print out the template and trace it onto a nice handmade paper. Then cut four pieces of paper for the interior pages measuring 7-inches by 4.5-inches. Score and fold the envelop piece on the fold lines noted on the template. Then score and fold the interior pages in half to create eight pages measuring 3.5-inches by 4.5-inches. Next, use an awl to make three evenly spaced holes on the center fold of the interior pages. Using the interior page as a template, poke corresponding holes through the exterior evnvelop piece. Use a basic pamphlet stitch to hold the pages in place. 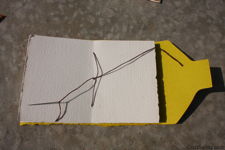 To do this, thread a piece of waxed linen measuring about 12-inches through the top hole from the outside of the journal to the inside, leaving about a a 3″ tail on the outside of the journal. Skip the middle hole and thread the waxed linen back to the outside of the journal through the bottom hole. Next thread both end pieces through the center hole (one at a time) to the interior of the book and tie in a double knot to secure. Now fold the envelope around the pages and make two dots on the cover to mark the length of the slit you need to make to fit the tab. (This is marked on the template.) Use an awl to make two small holes (through the cover only) where the dots are and then use a straight edge to draw a light pencil line connecting the dots. Cut a slit on the line and tuck the paper tab into the slit to close the journal. Now for some fancy envelopes… Download the large and small envelope PDF templates and you can quickly whip up some envelopes made out of lovely handmade paper or whatever else you’ve got around the house. If you don’t have any handmade paper on hand, feel free to whip up some recycled envelopes using colorful magazine pages. Trace the template of your choosing onto the paper you wish to use and cut out the envelope. Score the fold lines as marked on the template. Fold in the side tabs in and apply a little glue to these tabs before folding up the bottom of the envelope. (You can use fancy glue, but I used a glue stick and am happy with the results.) 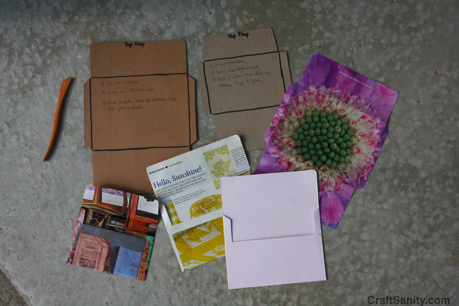 Once the glue dries you’re ready to use your handmade envelope to send a letter to a friend. Ok, I have to get back to finishing the fall issue of CraftSanity Magazine due out later this month. Check back soon for a fun issue 4 preview. Have a great weekend! Q&A With ‘Sewing With Oilcloth’ Author Kelly McCants & Book Giveaway!